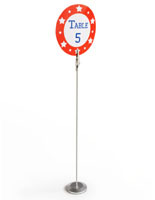 This display holder features an alligator clip to hold your signage! Strong alligator clip secures signage! Metal base prevents tipping over! Materials stand at a perfect 4" above table top to grab attention! 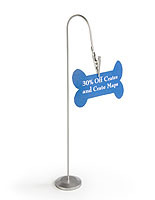 This display holder provides a means of advertising specials or promotions. The display holder, such as a display stand, or our ASH57 is ideal for restaurants or bars running daily or weekly specials. Simply clip your signage into the sturdy alligator clip and use the table top display stand to increase sales or reduce extra inventory. The display holder, a highly effective POP display stand can also be used in retail or community locations to announce sales, clearances, or events. 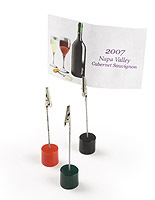 Simply place a display stand atop your slatwall display or brochure holder. 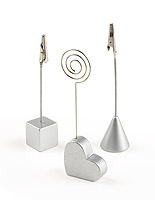 A highly versatile piece, this silver display holder accents any space. The table top unit is a portable display holder but could easily be secured to a variety of surfaces with glue dots or superglue. The simple, non-confining design of the holder allows for advertisements, specials, photos, or signs up to ½" thick to be placed either vertically or horizontally. 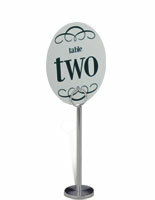 The table top display holder, including its base, extension, and clip stands 4 ½" high and weighs only ounces. This POP display is the perfect solution for in-store advertising and promotion.